This week Minister of Foreign Affairs Linas Linkevičius said that unfortunately Molotov still lives and is looking for his Ribbentrop. The tensions caused by an aggressive neighbour, which tests European unity at every opportunity, raises questions of whether we are creating our joint future with more than slogans. Former President Valdas Adamkus friends and those likeminded gathered in Vilnius, speaking of the need for Eastern European leadership. According to President V. Adamkus, it is crucial to gather the best minds and most prominent politicians to revitalise leadership in the Eastern region, which would inherently help ensure the safety of the countries in it. That said, political scientists are fairly sceptical of such attempts to obtain joint political will because the states, while neighbours, are primarily self-interested, often enough even competing among one another. President Valdas Adamkus did not hide bitterness when listing the country's foreign policy failures – Lithuania is losing the positions it held in the region. "Lithuania together with Poland, with post-Soviet countries, has travelled a long road and reached many strategic goals. Today we are trying to safeguard our achievements, but we must face the facts – ever more rarely and with less vigour do we participate in forming foreign and security policy agendas in the region, we are losing initiative and leadership," V. Adamkus said. 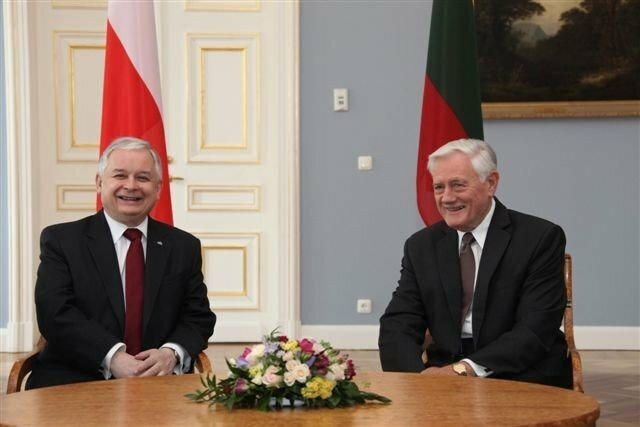 Poland was Lithuania's backer on the road into NATO and President V. Adamkus maintained excellent relations with both Aleksander Kwaśniewski and Lech Kaczyński. In 2008 when Russia bombed Georgia, they took the same flight to the conflict zone, mediated in President M. Saakashvili and the opposition's conflicts, mediated during the Ukrainian Orange Revolution – prevented armed conflict. Presidents V. Adamkus and L. Kaczyński entered energy security into the European Union agenda – the necessity to create a common EU energy system. This is when the electrical energy bridge project was started. During his final visit in Vilnius, the then Polish head of state spoke of a joint gas infrastructure during a meeting with President Dalia Grybauskaitė. On the same day the Lithuanian Seimas discussed and, unfortunately, rejected the so-called "W question". The Polish Rzeczpospolita described this step by the Lithuanian Seimas as a weight attached to the legs of those who care about good relations between Lithuania and Poland. "I would like to stress that this greatly hampers close cooperation between our countries. 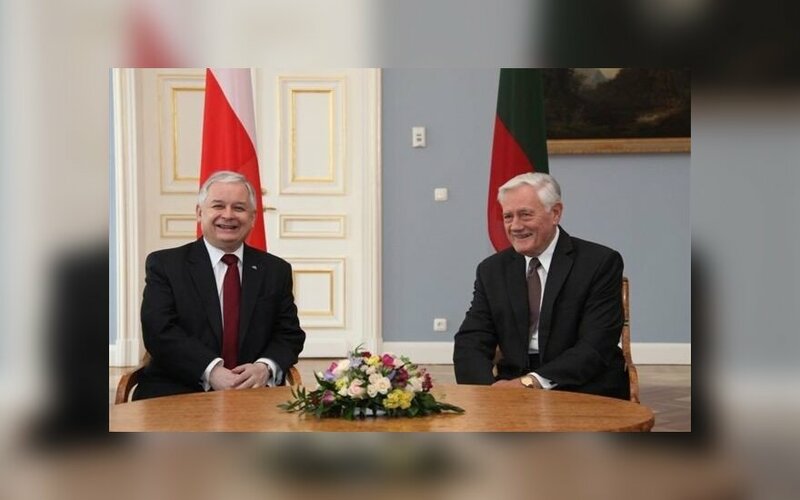 I believe that it is in our common interest because specifically this problem allows the opponents of our good relations to have their arguments," Polish President L. Kaczyński spoke on April 8, 2010. His aircraft crashed near Smolensk, Russia a few days later. Member of Seimas Žygimantas Pavilionis says that these unfortunate circumstances had a long term influence on Polish-Lithuanian relations. "Our greatest friend who visited Lithuania 16 times, more than any other capital, one who worked hard in energy, security and all other issues, we handed a little surprise, furthermore three days later this man died near Smolensk. This is something that the Polish right-wing elite certainly cannot forget," Ž. Pavilionis, a member of the Seimas TS-LKD group, said. President V. Adamkus bitterly pointed out that the Lithuanian government has been unable to come to terms with the country's other neighbours either. "Something is wrong if we are losing friends not only in Central European capitals, but also in Riga and Tallinn; even the other Baltic States do not support us regarding vital energy questions. Russia is building a nuclear bomb next to Vilnius at the hands of the Belarussians and we aren't even able to convince EU countries of our concern," the former president said with regret. V. Adamkus urged to also gather allies against Russia's aim to entangle Europe in its gas infrastructure even more, increasing dependence. Lithuania has almost escaped the clutches of Gazprom, but the Nord Stream pipeline being constructed beneath the Baltic Sea will attach itself to Central Europe and importantly – to Germany. Currently Gazprom supplies a third of European gas. This week Vedomosti announced that "Gazprom will still fight for Europe." Gazprom has not been concealing its disappointment that American liquefied natural gas has reached Lithuania and Poland. President V. Adamkus urged to raise the question of Nord Stream 2 at the EU summit meeting, to gather the region's main leaders and discuss new energy security issues. For now the Baltic States are more inclined to calculate personal benefit and there is a lack of political will to achieve joint decisions. Political scientists are not optimistic over common regional policy. "In my opinion both domestic policy and economic calculations are the reasons that were obstructions and likely will continue to be, unless crisis situations occur, at which point join action over external threats will certainly appear inevitable," VU TSPMI director, professor dr. Ramūnas Vilpišauskas said. "It is most likely fairly naïve to hope that a drastic shift could happen just after calling for a meeting or after a high ranking leader summit," Linas Kojala, the head of the Eastern European Research Centre, said. President V. Adamkus stated that he is certain that with nearing elections we will hear a number of proposals to be more pragmatic, return to realpolitik relations with Russia. He warned that the concept of realpolitik is most often not from the vocabulary of political science, but that of propaganda. It is used to cover shameful, dirty and often even criminal decisions, thus the former president urged to not betray our values. "The politics of Lithuanian-Russian relations today is primarily Georgian and Ukrainian freedom and territorial integrity. As Lithuania's greatest security interest and challenge to every European's awareness and conscience. Today the Ukrainians are fighting and dying for Europe, its history, the present and future, as well as for our freedom, thus trading away our values behind their backs would be the greatest and most amoral betrayal," V. Adamkus said. The head of the Eastern European Research Centre is convinced that Lithuania has not strayed from its path and has not left Ukraine and Georgia on their own. "The only country which send weaponry to Ukraine, we are those who were very loyal, reminding the EU that the war in Ukraine never ended and continues to this day, even if it receives less attention in Western media. That leadership exists," L. Kojala said. Minister of Foreign Affairs Linas Linkevičius agrees that there is a need to talk about leadership and seeking joint solutions because we are living in a world where the unity and value base of Europe are constantly tested. Lithuania, the minister notes, must be active and leadership is certainly not dependent on the country's size. "We have the potential and opportunities to truly grasp that leadership, but it is only possible when you take responsibility. Leadership based on empty slogans will impress no-one," L. Linkevičius said.